The Kuiper belt is a is a region of the Solar System beyond the planets, extending from the orbit of Neptune at 30 Astronomical Units (AU) to approximately 50 AU from the Sun. 1 AU is exactly 149,597,870,700 meters (92,955,807.273 miles). This is the distance from the Earth to the Sun. The Kuiper belt is similar to the asteroid belt although 20 times widers and twenty to two hundred times more massive. Within the belt are small bodies and left overs from when the Solar system was forming. Kuiper belt objects are composed largely of frozen volatiles (termed "ices"), such as methane, ammonia and water. Within the belt lies the newly reclassified dwarf planet, Pluto. Pluto is composed primarily of rock and ice. It is about approximately one-sixth the mass of the Earth's Moon and one-third its volume. Five moons have been discovered orbiting the dwarf planet. With just two years left before the rendezvous, NASA's science team are getting worried that debris within Pluto's system may damage the New Horizons and put its mission objective in jeopardy. 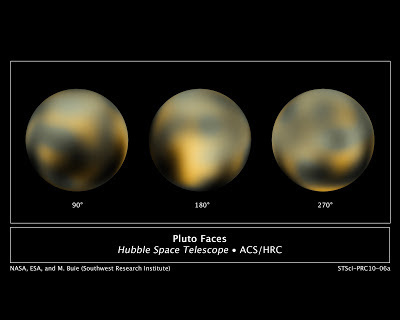 "We've found more and more moons orbiting near Pluto — the count is now up to five," says Dr. Alan Stern, principal investigator of the New Horizons mission and an associate vice president of the Space Science and Engineering Division at Southwest Research Institute. "And we've come to appreciate that those moons, as well as those not yet discovered, act as debris generators populating the Pluto system with shards from collisions between those moons and small Kuiper Belt objects." "Because our spacecraft is traveling so fast — more than 30,000 miles per hour — a collision with a single pebble, or even a millimeter-sized grain, could cripple or destroy New Horizons," adds New Horizons Project Scientist Dr. Hal Weaver, of the Johns Hopkins University Applied Physics Laboratory, "so we need to steer clear of any debris zones around Pluto." To better prepare for the mission, scientists are using computer simulations, powerful telescopes, space probes, and even the Hubble Telescope to map out where the debris may be located. They are also plotting out alternative routes that New Horizons can take that will ensure the safety of the craft and also preserve its mission objectives.